There was a button we used in a recent ScuttleButton puzzle that listed two candidates — “Re-elect Joe & Art/Vote Republican” — candidates whose identity we don’t know. In fact, we often come across buttons whose origins have escaped us. Thus, every now and then we post some of these unknown items, in the hope that you can identify them. Previous “Who Dats”: Unknowns beginning with the Letter A, Letter B and two pages for Letter C (here and here). Gomer C. Davis ran for county commissioner in Scranton PA. According to this eBay auction, he was also a clerk and mayor in the 20’s-30’s. Allen was a Republican candidate for Congress from Bucks Co. Pa. I am wondering if the I’M FOR DOYLE is for James Doyle, Sr. in one of his Governor bids in Wisconsin in the 1950’s? No, this button is probably a NYC-area item from the 1960s. Not Wisconsin. 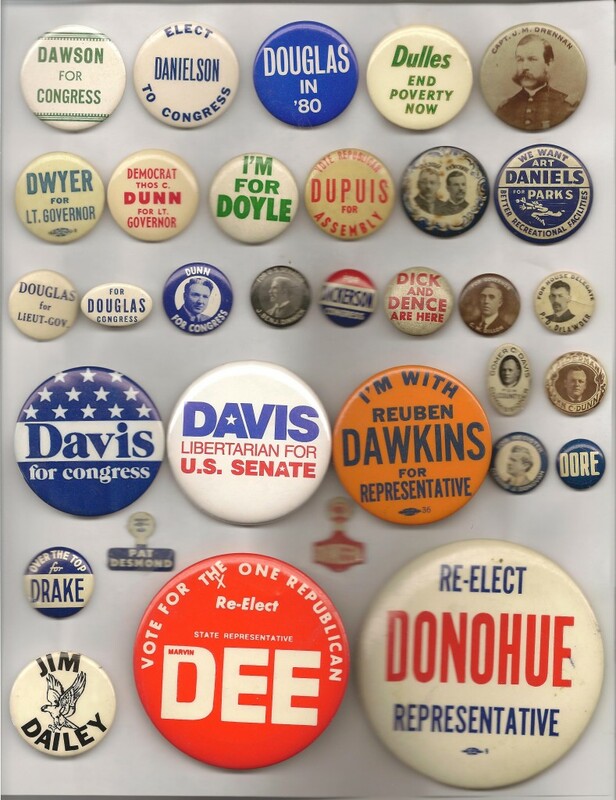 Reuben s Dawkins democrat 1964 Ward 12 Boston was a City Atty.Boston 1960. Law license suspended in 1990’s. Not Elected. I know this is a bit late, but. . . State Rep. Marvin R. Dee served in the Illinois House as a Republican from the 20th District. Elected in 1972, he served only one term. See Illinois Blue Book, 1973-74, p. 95, and 1977-78, p.211. The slogan was apropos, because he was “the one Republican” elected from a three-member district. Wickwire and Dodge are Canadian politicians who ran for an were elected to, what is called a “dual member constituency in the province of Nova Scotia Canada. The button is from sometime between 1900-1910, I believe. They represented the Liberal Party.